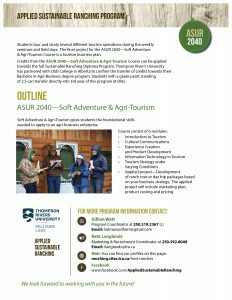 Join us for the Soft Adventure & Agri-Tourism course! 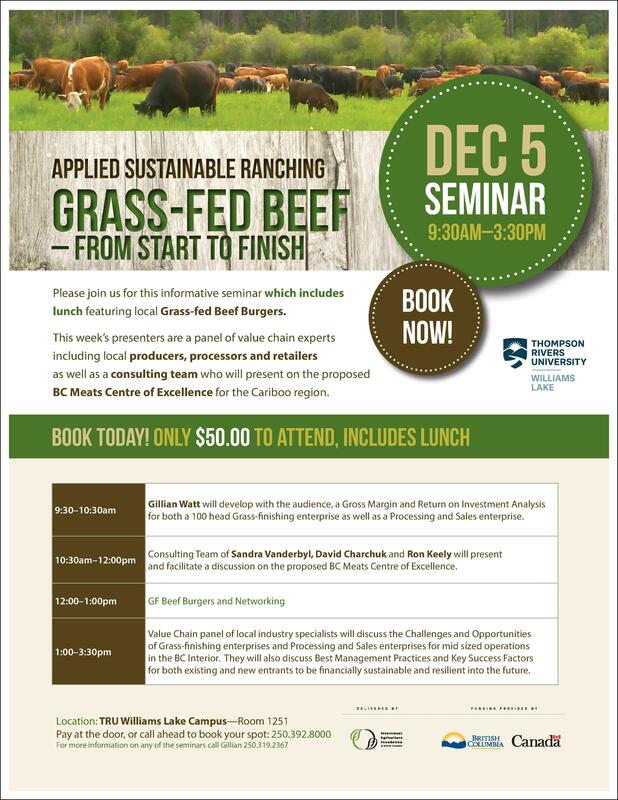 Several fellow producers have already signed up for the Applied Sustainable Ranching program, but we understand that it is a serious investment for hard working producers with limited time. Q: I’m struggling with the cost, how can I make it work? A: Cost and time are big issues! We know what it’s like to struggle financially as ranchers. We also know that the industry knowledge and networks you make in The Applied Sustainable Ranching program can help you save you hundreds of hours of labor, increase your production, show you how to make more profit with diversification enterprises and enjoy a better quality of life as a result. We are going the extra mile to provide extraordinary value for our students through our seminars, field days and industry driven content. We have some practical suggestions on how to make this program a fit for you. We have significant financial awards available for students. In fact, 85% of our students receive a financial award towards their tuition. The program also qualifies for student loan funding through the government. These courses are block based so you can take courses that fit your budget which allow you to work towards the diploma gradually. If you really want to take this program, call us so we can work with you to make it work. Q: What’s the deal with online learning? A: Students are introduced to Moodle, and online course delivery where assignments are uploaded and students can see assignments for the week. Completed assignments are then turned in to instructors. Some research online is required. In-person seminars happen once a week, but if you are on a host ranch, or are at a distance from the Williams Lake campus students have the option of participating through video conferencing. All you need for this is an internet connection. Q: What’s the deal with applied learning? A: Applied learning is an integral part of our students learning process. Students who do not have a home ranch to gain experience on during their studies can be placed with host ranches to ensure they are getting the applied skills needed. 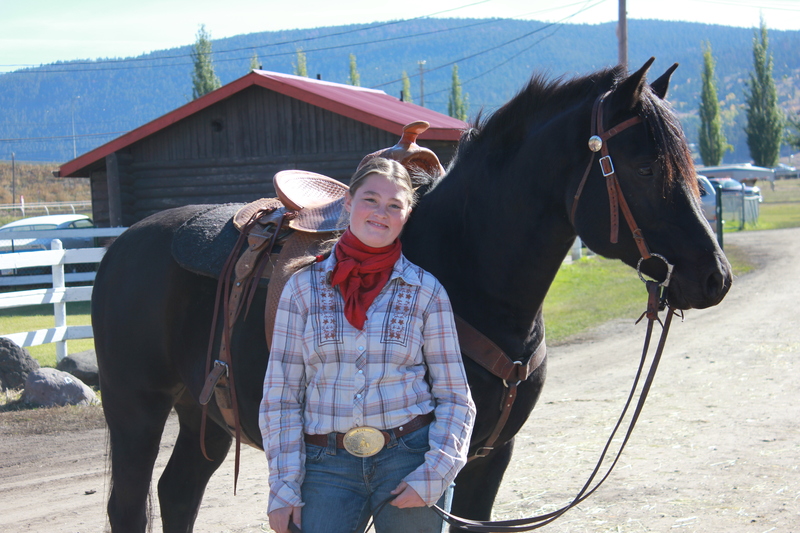 Work based learning at host ranches will consist of approximately 15- 20 hours per week. 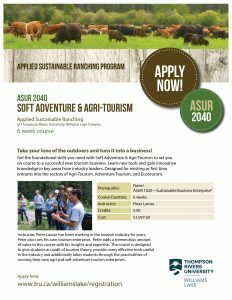 Credits from the ASUR 1020- Sustainable Business Enterprise can be applied towards the full Sustainable Ranching Diploma Program. Thompson River’s University has partnered with Olds College in Alberta to confirm the transfer of credits towards their Applied Bachelor in Agri-Business degree program. Students with a grade point standing of 2.5 can transfer directly into 3rd year of this program at Olds. We really hope that being at your home ranch or on a host ranch can help offset part of the cost of enrolling in the course for our students because it allows them to work on their own enterprises or have accommodation provided at host ranches while they attend school. Q: I am not a rancher yet but I want to be one, can I still join the program? A: Yes! In fact several of our graduate students were not ranchers but wanted to gain the benefits of the program to apply to related fields or enterprises. The program focuses on a strong foundation of business skills. We encourage students to become familiar with the basic principles of all aspects of ranching- business, production, bio-diversity, soils, grazing management -all with a strong environment component. The content of the course is presented in a modular block learning approach, we believe that serious ranchers of all levels will be able to follow along and get great value out of it, given that they are familiar with the basic principles of agriculture. Pairing you with one of our host ranches will give you invaluable lifetime experiences that will remain with you throughout your life. Q: What kind of jobs can the program help me get? Q: I’m already really busy with ranching and other responsibilities, will I have the time? A: When you join the Applied Sustainable Ranching Program, you’ll be expected to do approximately 20 hours per week of homework. The work is paced to work around applied learning on a host ranch or on your own operation, meaning you can go as fast or slow as your schedule allows as long as your homework is completed within the week. Sheep Production with Gillian Watt begins January 15, 2018. 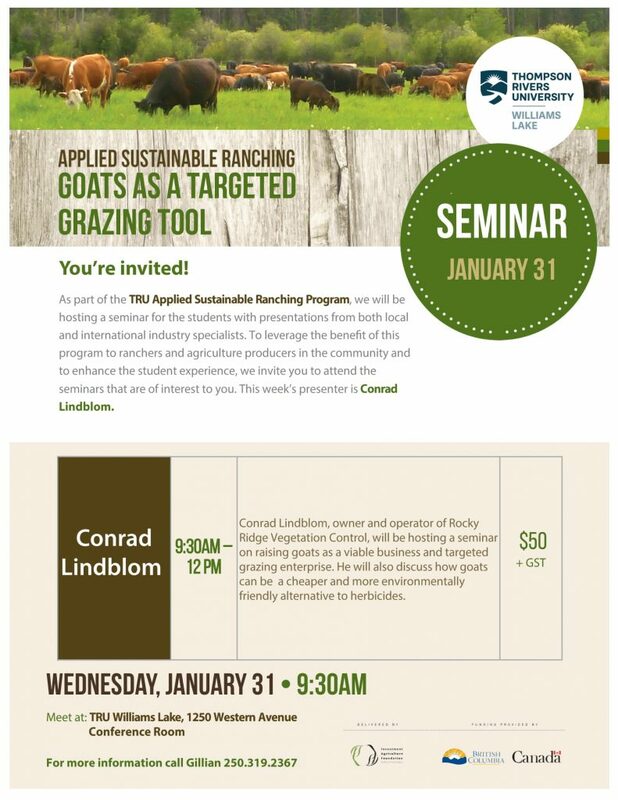 Registration for this module is open now to students and the ranching community. If you are looking to add to your knowledge and skills in sheep production, look no further than this course! Gillian brings her years of knowledge and experience to the classroom with Sheep Production. 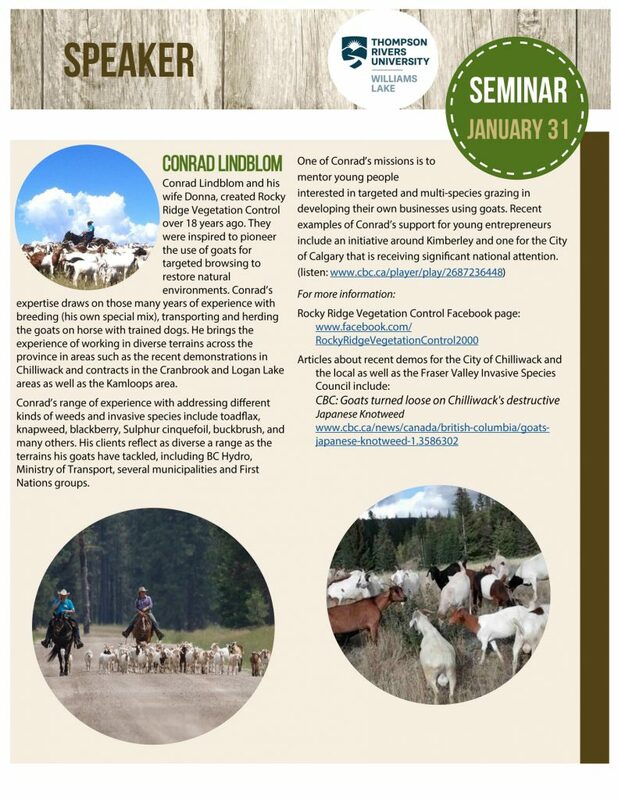 This course is great not only for full-time students in the TRU Ranching program but also for those in the industry looking to add to their existing skills and for those new entrants to the industry. Seminars are one day per week, either in person at TRU or online & via video conferencing. SHEEP PRODUCTION IS A PREREQUISITE FOR – “ASUR 2060- BIOLOGICAL WEED CONTROL WITH GOATS” Coming in the summer of 2018. Contact Gillian at 250-319-2367 to register. Feel free to share far & wide with your networks. New TRU Award Opportunity: Canada 150- Connect, Story Tell, Travel & Learn! 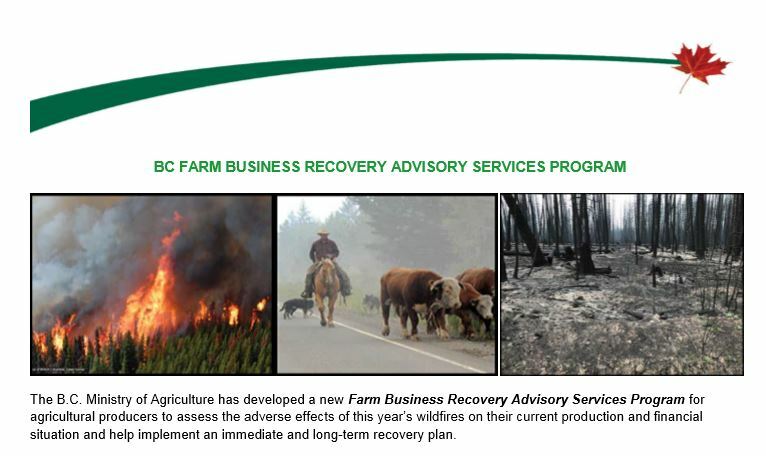 We are trying our best to get the word out about the BC Farm Business Recovery Advisory Services Program funding (up to $5000 for eligible applicants). 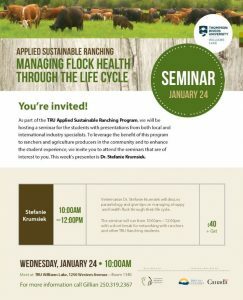 Join us for our latest seminar in the Applied Sustainable Ranching’s Speaker Series. 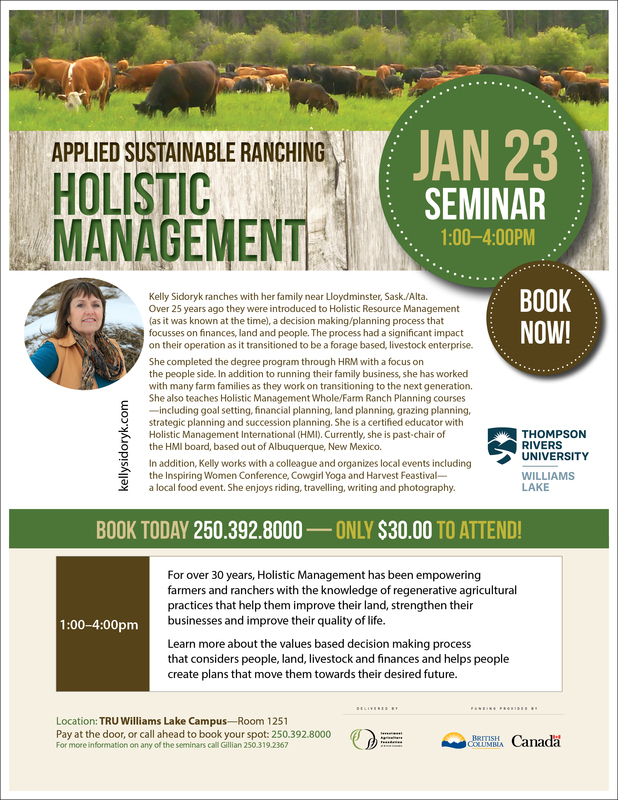 Thompson Rivers University’s Applied Sustainable Ranching program has been helping students on their home ranches and host ranches in the area access innovative education that they need to run future successful enterprises. Follow the story here.